CSIL Market Research Russia Furniture Outlook is part of the Country Furniture Outlook Series, covering at present 70 countries. What can be expected to happen in the Russian market in coming years? An executive summary (see The Key Facts of the Furniture Sector in Russia) provides a furniture industry overview, based on CSIL processing of statistics and company data from official sources, both national and international, as well as industry information and field information collected through interviews with companies and industry experts. CSIL then provides an independent assessment of the industry performance in Russia and prospects for the coming years. What is the market size and its growth rate? Russian furniture industry performance is illustrated through updated furniture statistics and through tables, graphs and illustrated maps. Information covers all relevant variables, from the supply side (see Productive Factors – sawnwood, wood-based panels, forest resources, woodworking machinery- and Furniture Production – by segment: upholstered furniture, kitchen furniture, office furniture; by geographical regions in the country) to the market side (see Demand Determinants – population, per capita GDP, households, residential dwellings and buildings, new office buildings and international tourism), Furniture Consumption - by segment: upholstered furniture, kitchen furniture, office furniture). Which is the structure of import / export? 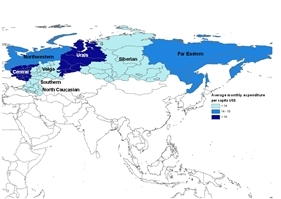 This study also considers the international trading activity (see Furniture Imports and Furniture Exports) including additional information on countries of destination/origin of furniture and placing Russia in a broader context by giving world comparisons of the imports/consumption and exports/production ratios. Is there potential for my business in Russia? Future industry prospects and CSIL's assessment of market potential are also provided (see Furniture Market Potential – in terms of size of the market, performance, furniture consumer spending, market openness, import penetration) and a cross-country comparison (see Annex: Rankings Russia among CSIL's 70 countries database ) further enriches the analysis. Who are the main players, in the Russian market, where are they, what do they do? Information on key-players operating in Russia are provided both for manufacturers and retailers (see Major Furniture Companies ) for a selection of 80 companies, and for other industry operators (see Sector fairs, Press and Institutional Bodies). Russia has a very large, fast growing and quite open furniture market, consisting of about 142 million inhabitants. According to CSIL ranking, the Russian furniture market is the 11th largest in the world (in 2002 it was the sixteenth), and it ranks ninth for furniture imports (in 2002 it ranked fifteen). Russian production is mainly domestic market oriented: just a small share of it goes to foreign markets (less than 5%). In terms of future prospects the Russian furniture market is even more attractive when benchmarked with the other main European markets where, according to CSIL estimates, the sales will be almost stable or slowly increasing in the near future.